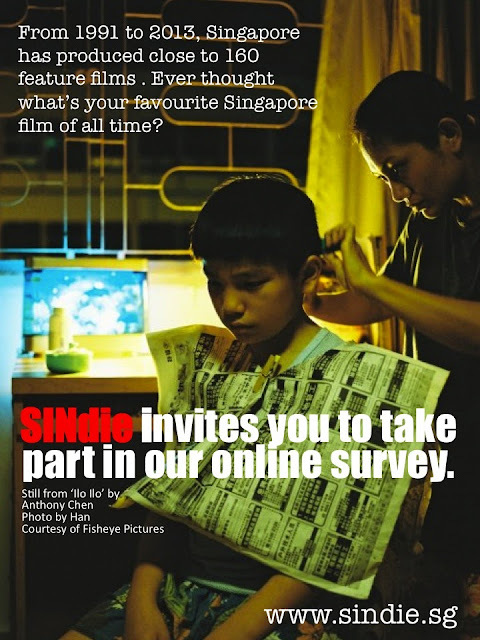 Click Here to Enter the Survey & Win Exclusive Prizes from SINdie! A long time ago, in a tiny island called Singapore, people were making films. But the few who called themselves "filmmakers" often went unnoticed. A recent win at Cannes sparked a new hope, and we found ourselves on the world stage again. It's too often, too easy to say "Eee, Singapore films, so lousy!" But have we really sat down to think, if we could have some gems in our short history of filmmaking; films which truly told our stories like no Hollywood or Bollywood could? What was the film that made you sigh with delight, that one film you always tell your foreign friends when they ask, "What film about Singapore should I watch?" Tell us about that one film from Singapore you brag about, when others say "We've got Almodóvar, Fellini, Spielberg!" You're sure, this film holds its own. It's time to revisit over 20 years of movie-making in Singapore and think about some of the best movies that are made-in-Singapore. Be a part of history. Have your say. Pick your favourite Singapore film today. For the first time ever, SINdie is launching a nation-wide survey on everyone's favourite Singapore film. For many years, SINdie has kept close watch over the rapidly-growing and fast-evolving Singaporean film industry. There were many films being made, but few encouraging and shaping the growth of the local film scene. Over the years, we have watched many rise and fall. Because we wanted to know who truly stood out, in the hearts of all, we're rolling up our sleeves and conducting our own massive survey, in our usual fantastic way. And because you already spent a good two minutes reading all of these, we urge you to spend another two, to think of your favourite Singapore film of all time, and tell us why!